Plants from all over the world are arranged aesthetically and where growing conditions best suit them. 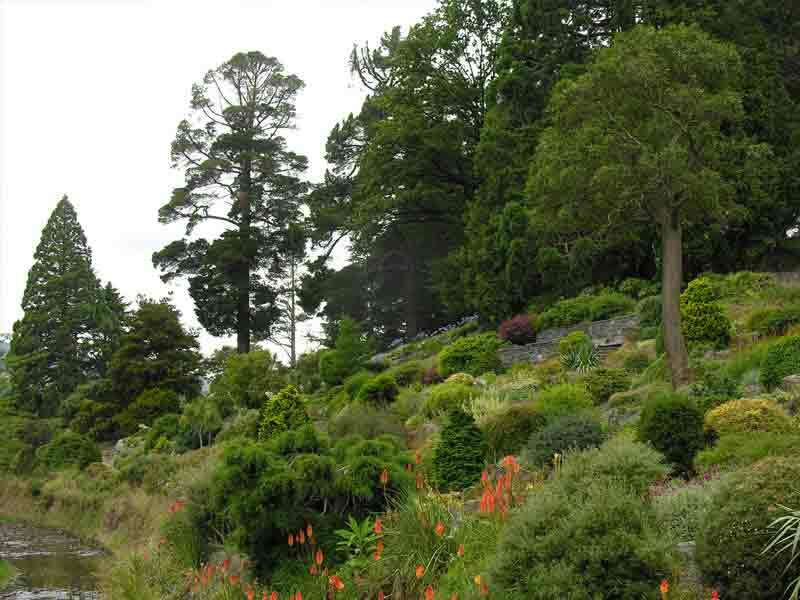 They are generally small rock and alpine plants although with the large size of the rock garden and the scale of the hillside and trees beyond it, some larger shrubs and trees are used. These provide form and character. Colour comes with their flowers in spring and summer and with leaf fall in autumn, while evergreen shrubs provide characteristic accents. The size of the Rock Garden allows larger trees and shrubs to be used without looking out of proportion. 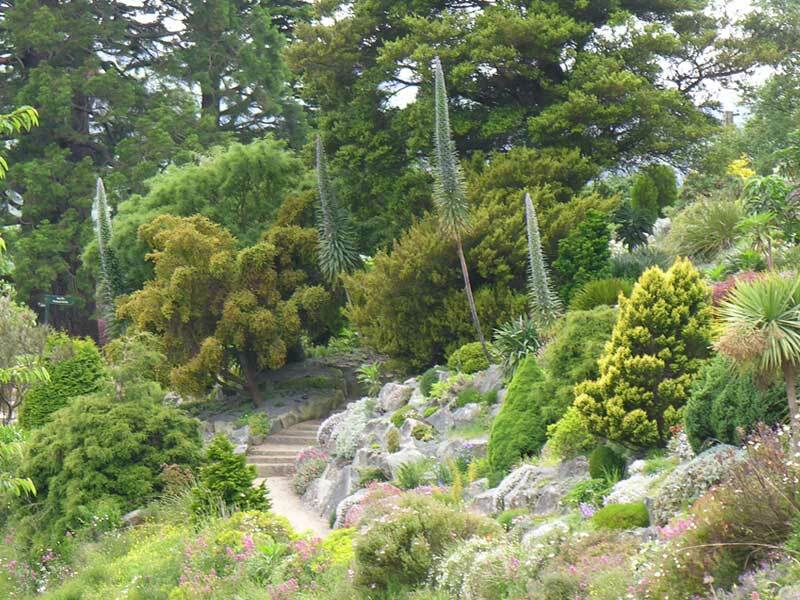 Some shrubs to look out for in the Rock Garden include: Berberis, Calluna, Pachystegia and Rhododendron. These help tie the garden together by creeping over the ground and spilling over rocks and walls. Many examples in the Rock Garden come from areas above the tree line where high winds and regular snow cover prevent taller growth. Highlights include Arctostaphylos, Lithodora, Phlox and Salix. These grow as tight mounds of densely packed shoots and leaves and are interesting because of their unusual form and texture. Their leaves, which can completely hide the stems, help prevent that reduce water loss and allow the plants to survive on loose debris and in rock crevices. Highlights include Androsace, Scleranthus, Raoulia and Saxifraga. These make up the largest group of plants in the Rock Garden. Some grow as rosettes, with leaves arising at ground level. In others, the leaves branch off an upright stem. Leaf shape and texture vary considerably. Highlights include Sempervivum, Primula, Celmisia, Meconopsis, Geranium and Potentilla. These include bulbs, corms and tubers, the leaves and flowers of which die back to underground storage organs during summer or winter. Most have a short but very showy flowering season. Highlights include Fritillaria, Cyclamen, Crocus and Narcissus. These almost always have interesting flowers. 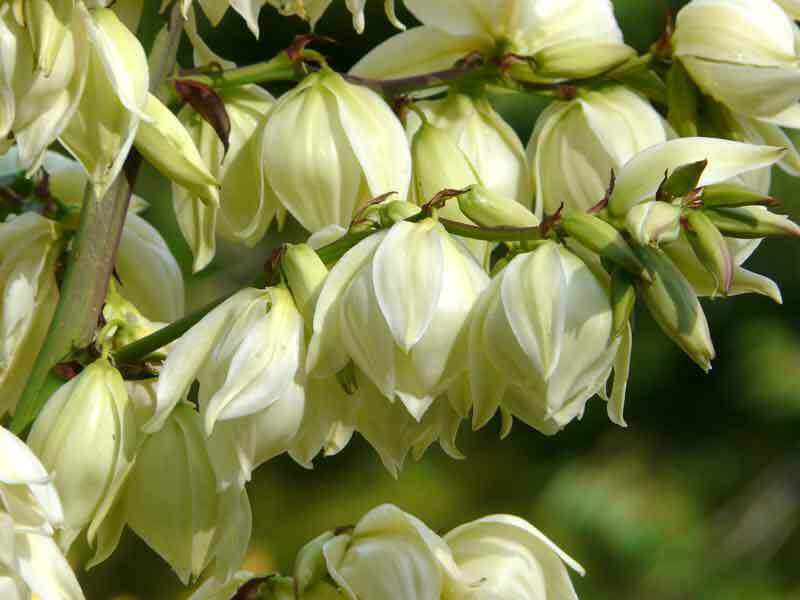 Unable to support themselves, they climb or ramble over other plants or structures to get maximum light for leaves and flowers, while their roots prefer a cool moist soil. Examples of climbers grown here are Clematis and Codonopsis. These have long narrow leaves arising from their base. They bring a striking variety of upright growth forms and contrasting leaf structures to the Rock Garden throughout the year. Highlights include Ophiopogon, Libertia, Iris and Yucca. This is the newest collection in the Rock Garden. It complements the mature conifers in the nearby arboretum, and ties in with rock garden plantings. Dwarf conifer cultivars show a variety of shapes, colours, textures and genera. This large, herbaceous perennial makes a visual transition to the mature trees of the arboretum further uphill. 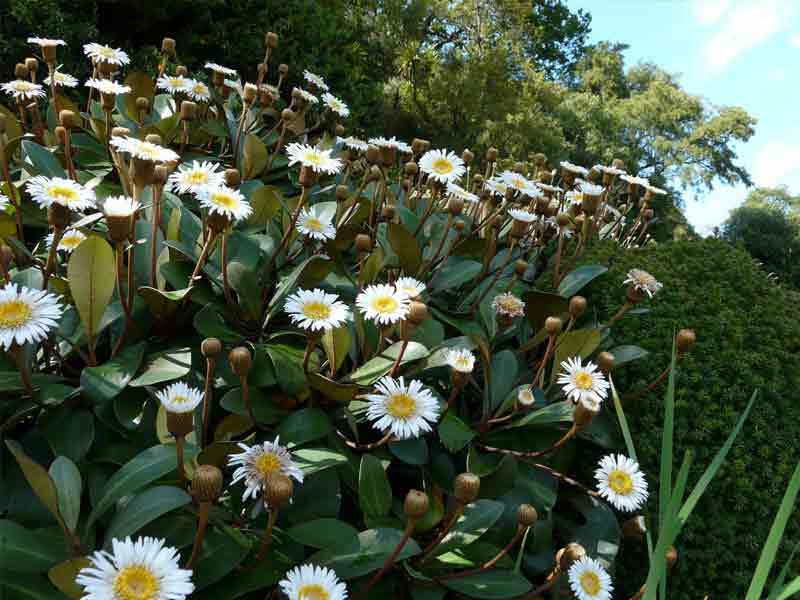 Native to the Canary Islands where it is endangered in the wild, it has naturalised in the Dunedin area. It can grow up to 6m tall, with blue flowers on a tall spike. The plant takes 2 or 3 years to flower then sets seed and dies. 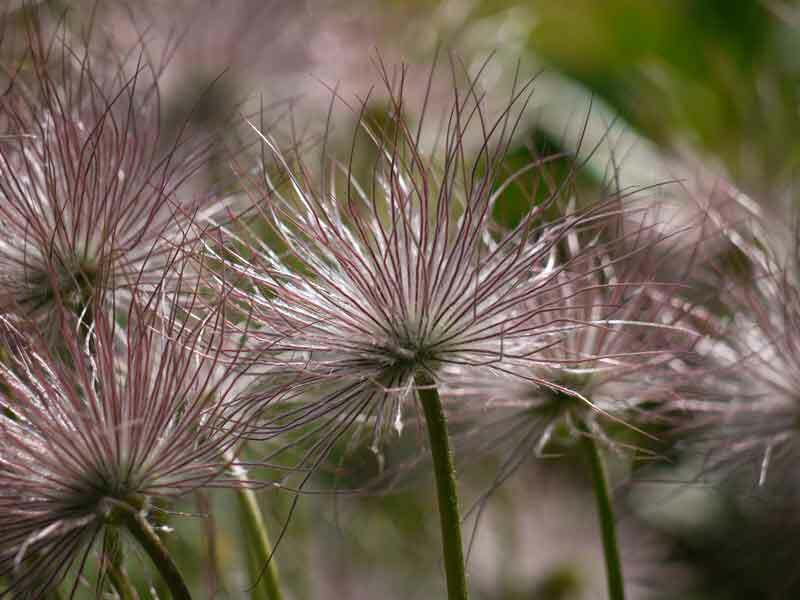 Spring flowers are followed by feathery new growth, and fluffy seed heads in summer. It grows in calcium rich soils of Europe, often on sunny slopes. Pulsatilla flowers at Easter in its natural habitat hence its common name, pasque flower (pasch is an old name for Easter). There are several different species of Pulsatilla planted throughout the Rock Garden. For colour at its most spectacular, visit in October and November, when the garden is bright with the pink of Phlox, the yellow of Aurinia and the blue of Lithodora.